With unparalleled service and commitment to quality we strive to exceed our client's expectations. "The system you designed and provided for our US Army Corps project in Charleoi exceeded expectations. The project was based on a performance specification with difficult mix temperature requirements that we were able to meet without the use of nitrogen or ice. To my knowledge, this was the first time the Corps had seen the combination of a wet belt and sand cooler. This combination greatly reduced the operational cost of the facility and proved to be very reliable." We are constantly searching for better and more economical ways to cool concrete. We have invented a way to cool sand using chilled air in a rotating drum. A new and innovative technique is using chilled air in a fluidized-bed sand cooler. We have a Patent Pending process to cool cement using chilled air in standard pigs or cement silos. We have greatly improved the efficiency and effectiveness of our flooded wet belt conveyors. On many jobs, we can eliminate rinse screens by cleaning dirty rocks on the conveyor. Our wet belts are shorter, more energy efficient and more economical than other suppliers. 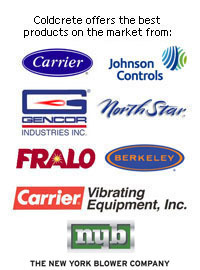 Check out our specialized products and services by viewing our presentation. 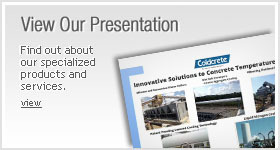 If you have a project that needs concrete cooling, Coldcrete can help.